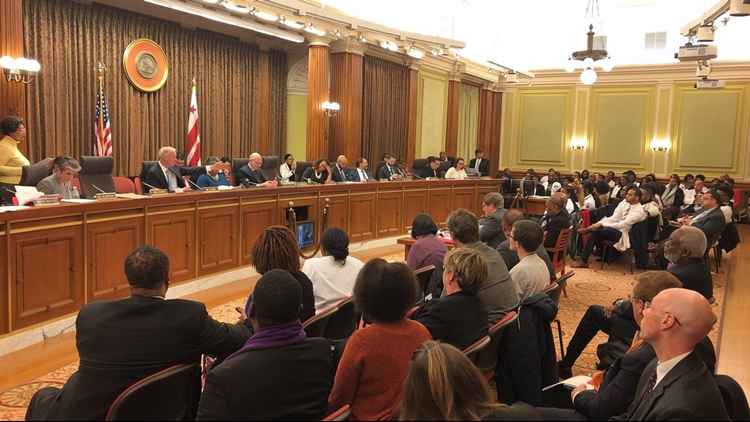 However, the bill's passage came after a debate over where that money should go, with some councilmembers calling for the money to be directed towards programs for people experiencing homelessness in the District. WASHINGTON -- On Tuesday, the D.C. City Council passed a bill that allowed the District to collect internet sales tax that meets certain requirements. That money was subsequently designated to lower the commercial property tax rate from $1.89 per hundred back down to $1.85 per hundred. However, the bill’s passage came after a debate over where that money should go, with some councilmembers calling for the money to be directed towards programs for people experiencing homelessness in the District. On Tuesday, Councilmember Jack Evans, who chairs the Metro board, explained that in 2014, when the idea of internet sale tax first came up for discussion, the Council decided it would be used for Metro. Evans said that gave them about $32 million. He used this as justification for calling for the internet sales tax revenue to go towards lowering the property tax. However, on Tuesday, Councilmember Nadeau offered an amendment to that bill that would take recurring internet sales tax in 2020 and put it towards lowering commercial sales tax 1 cent per hundred, while allocatting the remaining money towards housing programs and programs that benefit those experiencing homelessness. “Has the issue of issue of homelessness and housing instability in the District over the past five years lessened so much so that we no longer see them as priorities?” she asked her colleagues. Grosso, Silverman, Allen and Cheh also introduced the amendment. Silverman, agreeing with the amendment, said, “My staff has looked in the public record everywhere and we cannot find any agreement by this body to undo the property tax increase." She also said that in 2013, it was agreed that any sales tax would be split 50/50 between homelessness programs and WMATA. However, both Chairman Mendelson and Councilmember Evans dissented. “Our commercial property tax is the highest in the region,” Mendelson replied, explaining his support behind the underlying bill. “We’ve heard that commercial property tax is the highest in the region. You know what else is? Homelessness,” Nadeau countered. At the vote, Nadeau’s amendment failed 6-6, with McDuffie absent, with the underlying bill passing 8-4.